Debra Kristi was born and raised a Southern California girl. She still resides in the sunny state with her husband, two kids, and three schizophrenic cats. As a writer, she loves to dabble in multiple genres where the characters break the rules of normalcy. Unlike her characters, Debra is not immortal and her only super power is letting the dishes and laundry pile up. When not busy drumming away at the keyboard spinning new tales, Debra is hanging out creating priceless memories with her family, geeking out to science fiction and fantasy television, and tossing around movie quotes. 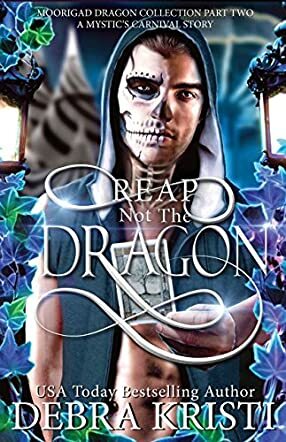 Reap Not the Dragon is Book 2 of Debra Kristi's contemporary urban fantasy, The Age of the Hybrid. This series is set in Mystic's Carnival, a special world that is the setting for a number of different authors' works. Sebastian is a Reaper. He hasn't really accepted his being a Grim, an attitude his father is determined to change. His father's efforts at controlling him are making it even more difficult for Sebastian to help rescue Kyra, a hybrid dragon who's lost her memory and is being manipulated by her aggressive and domineering boyfriend, Marcus. Sebastian will go to any lengths to help Kyra, even if it means facing her very powerful fire dragon father. Debra Kristi's contemporary urban fantasy, Reap Not the Dragon, is fast-paced and enthralling. I've read several stories set in Mystic's Carnival and have come to know and love the characters who people this very special place. Reap Not the Dragon is Book Two of The Age of the Hybrid, and while there's enough background given for this novella to stand on its own, I would strongly recommend reading the first volume, The Moorigad Dragon, to get the full force of this powerful story. Sebastian is the perfect choice for a quest; he's single-minded in his determination but also confused by his dual nature, and he's all too aware of the darkness he's capable of. Kristi adroitly weaves his tale, and I was spell-bound reading it. Reap Not the Dragon is marvelous, dark and very satisfying, and as I finished it, I started to wonder when the next book in The Age of the Hybrid would appear. I hope it's soon. Reap Not the Dragon: The Age of the Hybrid, Book 2 is highly recommended. In the second book of The Age of The Hybrid series, Reap Not the Dragon, Debra Kristi depicts the challenges Sebastian faces along his way to find the key to his loved one’s lost memory. He fights magical demonic powers, including his own, with one goal in mind: finding the lost dragon to help revive Kyra’s memory. Kyra, whom Sebastian loves the most, is beside him in the middle of hell fire. Demons of cursed hell want him dead at any cost. He should defeat them all, but will Sebastian live for her, and fix the mistake he has committed? Debra Kristi’s book, Reap Not The Dragon, is a deep journey through two worlds: darkness and lightness. She spellbinds her readers with simple and snappy language, making reading this book an unforgettable enjoyment. Finding inner power, courage, love and hope are merely some of themes she follows, involving mythical creatures and characters. This book reminds me of Merlin and Constantine. Debra Kristi might have been inspired by these old stories. However, her unique style and storytelling skills make a remarkable tale to awaken people around the world. Reap Not The Dragon is a marvelously dark piece of work, with sparkles of hope and retrieving innermost powers to change the world we are living in, and save it for our loved ones. Debra’s original style in writing is intriguing, making every page of this book stick out in readers’ minds. Reap Not The Dragon is a fantasy novella by Debra Kristi, and is the second book in the Age of the Hybrid series. Its setting is the Mystic’s Carnival Collective, a world of magic and misfortune where several authors tell their stories. Kristi’s second tale in this domain follows where The Moorigad Dragon left off, with Sebastian the half-Reaper searching for a way to return his beloved Kyra’s memory. Having come to terms with his death-bringer skills, Sebastian forms a plot, but his plan is hardly put into action before fate steps in. This fast-paced novella hurricanes through a world of twists, turns and unfortunate circumstances as Sebastian faces a myriad of demons, some of which are the makings of his own mind. I particularly enjoyed the black humour present in Reap Not The Dragon, as Debra Kristi’s snappy dialogue endears you at once to the dry and ominous warnings of Sebastian. The novella is a fast read, but vividly described, and possesses a myriad of characters who leap right off the page for their sincerity and personality, despite the truly fantastical things going on in their world. Kristi’s prose is well-written and has a natural storytelling flair that gives yet more personality to the narration. Fans of character-driven fiction will truly enjoy this small instalment in what appears to be a much larger adventure. I, for one, was highly intrigued by Reap Not The Dragon’s action-packed ending, and would be excited to see how further demonic elements will be explained as the tale progresses.